After all your prediction about the end of Le Journal has been proven on the money. Le Journal Hebdo has been shut down. Yesterday, 5, yes 5, bailiffs showed up armed with a court decision to take over Le Journal Hebdomadaire and the company behind it, Trimedia.. What is still unclear to us is the legal argument that led the judge from the receivership procedure of Mediatrust to act against trimedia. The only link is the title:"Le Journal Hebdomadaire" but the title is owned by the publisher himself not the company. Although we are waiting to get a clearer legal picture, we can already officially announce the death of Le Journal Hebdomaire. 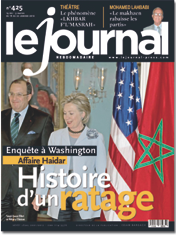 The story of Le Journal is in some sense the story of trying to hold to account the new Moroccan monarchy, which has received lavish foreign aid and diplomatic support for a moderate image it never fully earned. We've mentioned Le Journal frequently here, and Bou Bakr became over the last decade more than a magazine editor, but also a leading dissident, as the New Yorker aptly captured in its October 2006 profile, The Crusader [PDF, 8MB]. Amidst other developments in the treatment of the press, in the rise of police brutality and torture once again, and the continued makhzenisation of a once dignified opposition, it paints a sad picture of Morocco as the little country that could have changed and become a model for the rest of the Arab world, but didn't. We are the leading the world in providing best 650-293 exam product and 70-652 exam dumps prep solutions. Our incredible offers for testking 1z0-550 dumps and evergreen testking 350-030 dumps are accessible at reasonable prices. Our testking JN0-660 also have very rare in IT world.